Glue the two 1" pom-poms, one on top of the other. The top pom-pom will be the head, the bottom pom-pom will be the body. Try using pom-poms with metallic threads in them. Glue one 1/3" pom-pom to the front of the head, just below center to form the snout. Glue two 1/2" pom-poms to the top of the head to form ears. Glue one 1/2" pom-pom to either side of the body to form arms. Glue two 1/2" pom-poms to the bottom of the body to form legs. Glue a black bead to the end of the snout to make a nose. Glue on two black beads for eyes. Glue the satin bow under the snout. Glue the white bead to the center of the bow. Glue the brooch pin to the back of the bear. 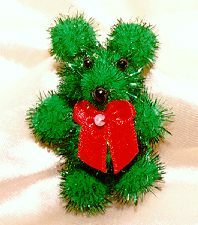 Alternately, you could glue on a satin ribbon and hang the bear like an ornament. Experiment making bears from larger pom-poms and hang them on the Christmas tree.